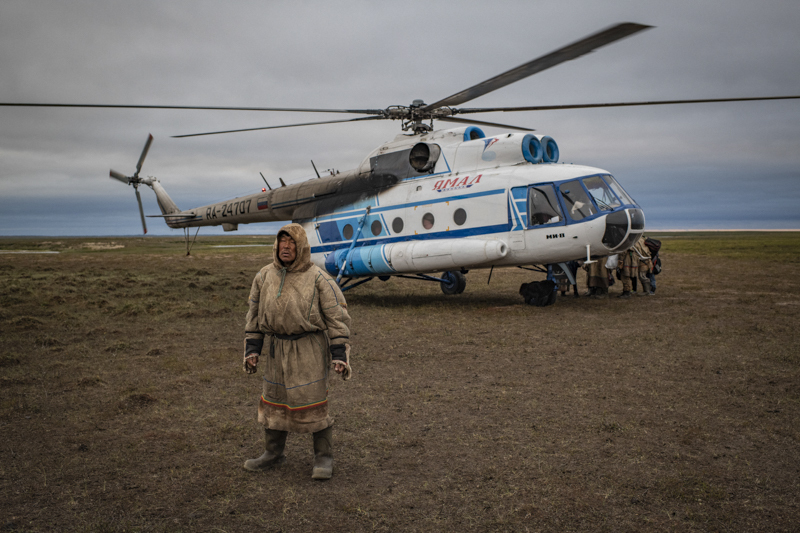 "Arctic: New Frontier", a pioneering double expedition by Yuri Kozyrev and Kadir van Lohuizen which explores the effects of climate change on the entire Arctic territory, is published in the Washington Post as a online feature as well as a weekend supplement. Through their project, they experienced the dramatic transformation of natural landscapes and the demographics in the Arctic, and the impact of these changes on the lives of the region’s inhabitants. This project is the 9th Prix Carmignac for Photojournalism, funded by the Carmignac Foundation. We are pleased to announce that NOOR photographer Robin Hammond has been awarded 2nd prize in the People category of World Press Photo 2017 for his portrait of 41 year old Hellen Alfred from Juba in South Sudan. "I am delighted to receive this award. For six years I’ve been working to highlight the challenges faced by people living with mental health problems. People like the South Sudanese woman in this picture, Hellen. No other health issue impacts more people, yet is so neglected. Stigma eliminates conversation, and the very existence of people living with mental health problems. It is my hope that the thousands around the world who will now see her face will ask - who is this woman? What is her story? That is the moment mental health stops being about an abstract and ignored issue and starts being about individuals who deserve to be seen, and need to be heard." Hellen's portrait is part of Robin Hammond's In my world, a project which seeks to humanize a neglected and abstract issue by allowing people living with mental health problems to be seen and heard and, as a result, have mental health become the global health priority it deserves to be. "Congratulations to Associated Press photographer Burhan Ozbilici for the World Press Photo of the Year and also to all winners of 2017 World Press Photo Contest! NOOR Photographer Robin Hammond won second prize on People - Singles category for his beautiful portrait of 41 year old Hellen Alfred from Juba in South Sudan. Robin Hammond and his NOOR’s colleagues are confronting the dominant narrative using visual storytelling with integrity and passion. As a group, they exist to inspire empathy and action. Congratulations Robin!" To document the mental health impact of conflicts and disasters in sub-Saharan Africa, photographer and human rights campaigner Robin Hammond travelled to eleven countries. He spent time with the displaced in refugee camps, former child soldiers in slums and saw the impact of corruption on facilities for the mentally ill. The resulting work went on to become the book: ‘Condemned: mental health in African countries in crisis,’ and was published in magazines globally. The work has been exhibited on every continent, and went on to win some of photojournalism’s most prestigious awards. Robin spent five years working on his mental health project. In the course of that work he came to recognize that a lack of space for the voices of people living with mental health problems is a major impediment to a world where mental health is recognized as a global health priority. In addition, stigma and silence form twin barriers in the path towards a society where people living with mental health problems can be seen, and valued, as equal members of the communities in which they live. With In my world, Hammond and his not for profit organization, Witness Change, are working to contribute towards breaking down the stigma surrounding mental health and to the amplification of these marginalized voices. Robin is working with a group of partners including Handicap International, other not for profit organizations, and a major educational institution to share stories of people living with mental health problems and document the situations in which they must live. In my world, will be live from June 2017. LUMIX Festival for Young Photojournalism. We are pleased to announce that NOOR photographers Francesco Zizola and Sebastián Liste have been awarded in WORLD PRESS PHOTO 2016! Francesco Zizola has been awarded 2nd prize in the Contemporary Issues category of World Press Photo 2016 for his series 'In the Same Boat'. Sebastián Liste has won 3rd prize in the Daily Life category of World Press Photo 2016 for his story 'Citizen Journalism in Brazil's Favelas'. We are pleased to announce that Francesco Zizola has been awarded third place in the Exodus category of the Pictures of the Year international competition for his series ‘In the same boat’. Exodus is a new category of this year's Pictures of the Year International competition, for single photographs depicting the desperate migration of individuals and families from their native homes seeking sanctuary from political or religious persecution. We are pleased to announce that Nina Berman has been awarded the 2016 Aftermath Project grant for her proposal "Acknowledgment of Danger" which will document the toxic legacy of war on the American landscape. Nina has spent most of her career investigating the American military, the human cost of war and the militarization of American life. Alixandra Fazzina’s project ‘A Million Shilling – Escape from Somalia’ is showing at Musée d’Art Moderne de la Ville de Paris, as part of the Prix Pictet Finalists Exhibition, running until 13 December 2015. Across the Horn of Africa, war, abuse and poverty make millions miserable and drive thousands to attempt to flee by sea. The cost is just $50, or one million Somali shillings. With a one in twenty chance of not making it to the other side alive, it is a price they must risk their lives for. Alixandra Fazzina worked over a period of two years to chronicle the exodus of migrants and refugees from Somalia to the Arabian Peninsula. For her work on “A Million Shillings – Escape From Somalia”, she was a finalist in the CARE Award for Humanitarian Reportage, the W. Eugene Smith Grant in Humanistic Photography and the Prix Pictet.